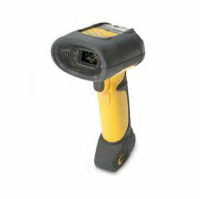 The DS3400 Series industrial bar-code scanners from Symbol Technologies use digital imaging technology to accurately capture all types of two-dimensional (2D) and one-dimensional (1D) bar codes while offering the high performance typically found only in laser scanners. The DS3400 Series provides resilience and performance in a ruggedized package. The scanners' exit windows are scratchresistant and recessed for a high level of durability, while their rugged housing, sealed to industry-leading IP65 standards against rain and dust, is designed to withstand repeated drops of up to six-and-a-half feet (two meters) onto concrete. We can help. For more information about the DS3408, or any of our products and services, call us at 1.800.457.8499 or email us. Order your DS3408 now. Your purchase order, with credit approval, is welcome, as well as all major credit cards, PayPal and Google Checkout. Remember, you'll get FREE technical service with every product you buy from Vecmar.